Which one would you prefer Oukitel K5000 or Xiaomi MAX 2? Home Phablets Which one would you prefer Oukitel K5000 or Xiaomi MAX 2? So really so is coming really popular Chinese shopping Festival called Singles’ Day which is actually celebrated everywhere in the world at 11.11 every year. Actually this shopping festival is great opportunity to buy a new smartphone as Christmas present for someone or for self. So we have suggestions for two different smartphones which are Oukitel K5000 and Xiaomi MAX 2. We have choosed this smartphones because they have very similar built-in hardware. So for example both have 4GB of RAM, 64GB ROM, and big battery. So for example Xiaomi MAX 2 has 6.44 inch screen with Full HD 16:9 display while Oukitel K5000 has 5.7 inch HD+ 18:9 full screen with 1440×720 resolution. But dont forget that you can hold K5000 in one hand while with MAX 2 is not easy. When we speak about design then we can tell that both smartphones has curved design including battery cover. Also about memory, CPU, and other built-in hardware we can tell you that K5000 has 4GB RAM+64GB ROM same as MAX 2. But K5000 is based on octa-core chipset MediaTek MT6750T while MAX 2 is based on Snapdragon 625. 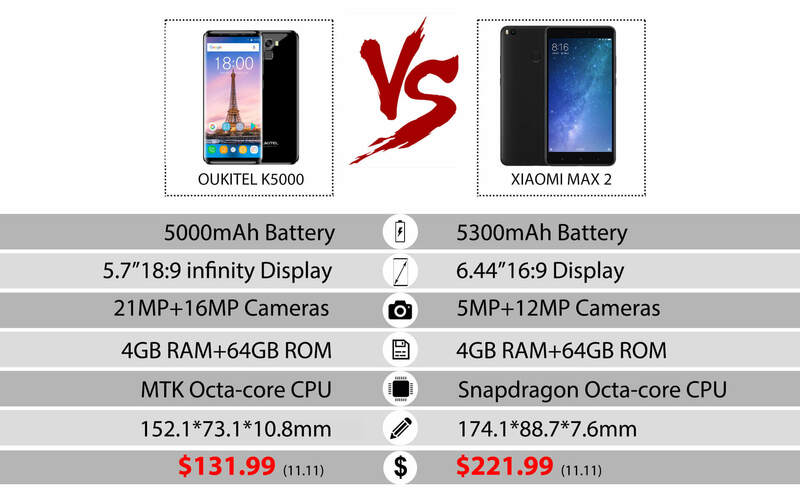 However about battery, MAX 2 has 5300mAh battery while Oukitel K5000 has 5000mAh battery. If you like to photograph with your smartphone then we can tell you that MAX 2 has 12MP rear camera while the K5000 has 16MP rear camera with Sony IMX135 camera sensor. If you’re curious about price, then we can tell you right away that Oukitel K5000 is much cheaper because price will be $131.99 while Xiaomi MAX 2 costs $221.99. And you can buy it at Gearbest online shop. 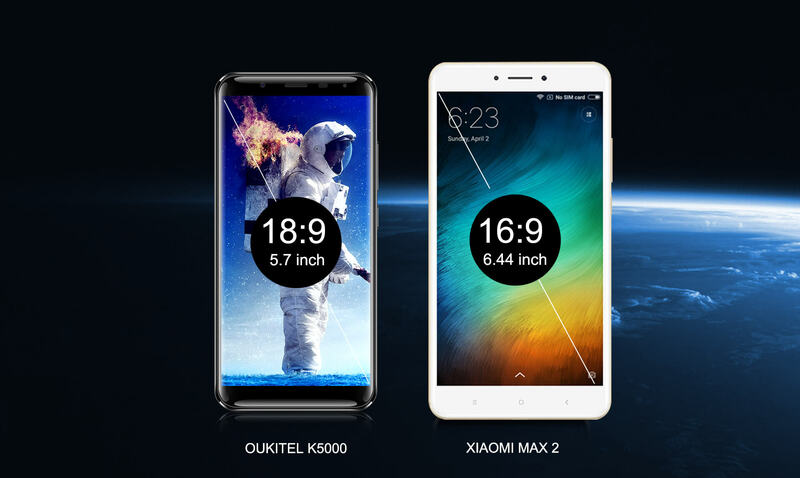 It’s certainly smart to buy Oukitel K5000, because it is cheaper and different between these two devices is not too big. Previous articleElephone folding smartphone soon?